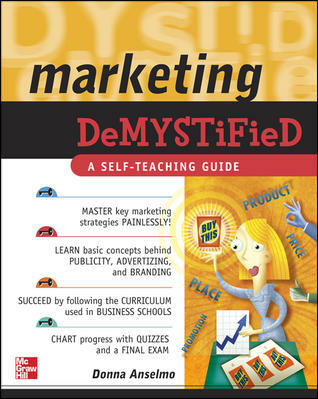 Marketing Demystified, published by McGraw-Hill Professional and written by Donna Anselmo, is a 380-page resource, brimming with marketing insights, strategies, tips and tools. Donna says, the goal of marketing is simple: attract customers who will purchase your product or services. Getting there, though, isn’t so easy. Meaningful marketing success involves a strong foundation in everything from planning, advertising, and publicity to Internet strategies, database management, and more. Enter Marketing DeMystified. Addressing every step of the process in plain English, this 380-page book helps you master all the tools at your disposal to cultivate strong brand awareness, maximize profits, and build lasting customer loyalty. This reader-friendly book includes real-world examples, end-of-chapter quizzes, and a final exam. Simple enough for a novice or student, but challenging enough for a veteran marketing manager, Marketing DeMystified is the most thorough and simple shortcut to decoding key marketing concepts and principles. Order your signed copy today at BoldMarketingSolutions.com.